During one of his many experiments around the middle of the 18th century, Benjamin Franklin noticed that a pith ball or cork would initially be attracted to a charged object, but if the two touched the ball would be repelled. He realized that this was because the two objects were initially charged differently (dissimilar charges attract) but once they touched they took on the same charge (similar charges repel). 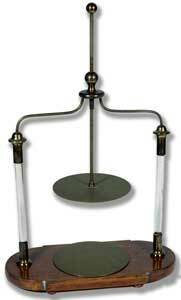 Franklin realized that if he replaced the charged object with a bell, he could make an "electric bell." He soon found practical use for his bell as a lightning detector. When connected it to his lightning rod, the bell would ring whenever an electrical storm was nearby. Apparently he forgot to disconnect the bells during one of his many trips to France and his wife was quite unhappy with him! Used to create spark and light effect with electro-static generator. With a silver dotted foil spiral conductor which carries electrostatic sparks continuously down the spiral in a dazzling display. 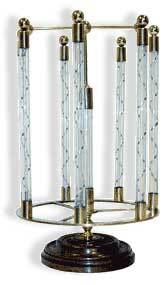 Popular electrostatic accessories where a dramatic electric display would be created if a static charge were applied to the brass ball finial atop the hand-blown glass tube, the charge would spiral down the path of tin foil disks leading down the tube(s). Little figures of pith or paper are meant to be cut out and laid on the lower brass plate; the top brass terminal is connected to an electrostatic machine and the pith/paper figures begin to dance and jump as they carry the charge back and forth between the plates. French, 1st quarter of the Nineteenth Century. Six Volta cannons arranged on a spinning disk. The cannons fire in sequence as each cannon's electrode touches the static machine. 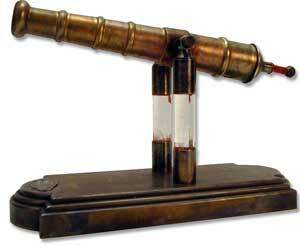 In 1777 Allesandro Volta was interested in the characteristics of swamp gases. In order to test flammability he invented his cannon (see below). He would collect swamp gas then fill his pistol with it. 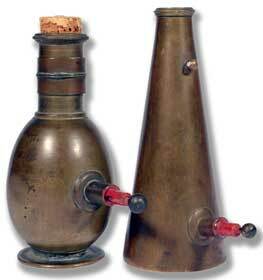 The cork on top would be put in after the pistol was filled, to keep the gas from escaping. 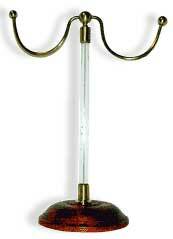 There would be a metal rod tipped with a brass ball in the cork at the bottom which would serve as a spark plug. Long after its scientific use had gone, the Volta Pistol remained a favorite lecture-hall demonstration. 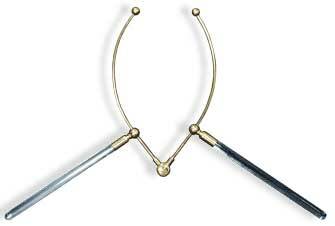 These devices was hardly practical as weapons and certainly not nearly as effective as gunpowder weapons which were common at the time. 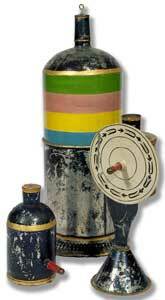 From right to left: 1 Volta Canister with Bullseye made of polychromed andvariously painted tin, cork glass and brass; measures 7-1/2" high and bullseye circle is 3-1/2" diameter; 2) Volta's Canister made of above materials, measures 4-1/4" in height; 3) Philosophical Instrument made of same painted tin and multi-colored striped barrel which fits into the main tin container. 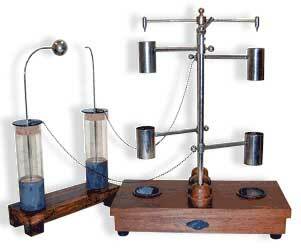 Unknown what this device was used to demonstrate but likely hydrostatics; measures 7-1/2" in height. French or German, late 19th century. 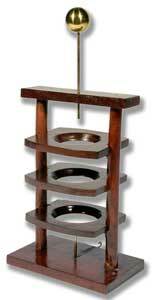 Consists of wooden frame and three wooden stands to hold as many eggs. A wire and brass ball pass through the upper part of the frame so as to touch the top egg. A piece of metal lays on the bottom of the frame, touching the bottom egg. As an electrical shock is passed on the upper brass ball, the eggs will become beautifully luminous. 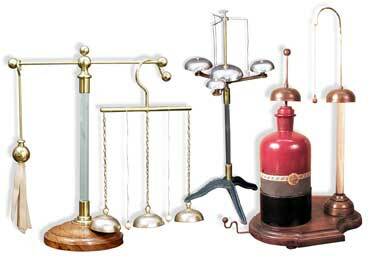 Apparatus is made of mahogany, whose base is 5" x 3" and is 7-5/8" in height. Described and illustrated in Pike's Catalog Vol. I page 293, figure 340. Fine condition. Likely English circa 1840. 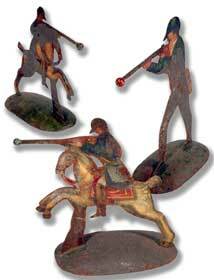 Three figures (left to right) made of hand painted tin with lead weights in base measuring 5-1/4", 5-1/4" and 6-3/8" high. They are beautifully painted, noting considerable loss of original paint. See pg. 283, fig 318 of Pike's Catalog Vol I. French; likely last quarter of the 18th Century. 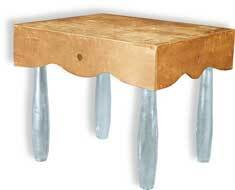 Includes: 1) Thunder House made of mahogany, brass, cork and glass. Measures 7-3/8" x 4-3/8 at base and wooden house is 9-1/4" high including brass ball at top of house; glass pillar is 6-3/4" high. Same apparatus as described and illustrated in Public and Private Science: The King George III Collection on page 515, figure E202 and in Benjamin Pike's Catalog Vol. I page 309, figure 369 2) Electrical Bells made of brass. Measures 9" in width from one outer bell to the other. See page 272-273, figure 296 in Pike's Catalog. 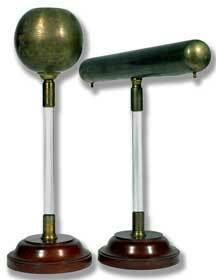 When exposed to the static electricity of an electrostatic generator these bells give a continuous sublime chime. 3) Set of three Leyden Jars measuring 6", 6" and 6-1/2" high; see pg 260, fig 276 Pike's Catalog; 4) Electrical Pail made of tin, 2-3/8" diameter at top. See pg. 285, fig. 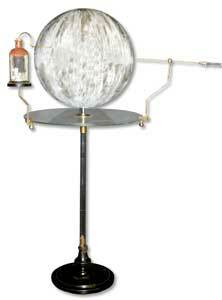 322 Pike's Catalog; 5) Electrical Flyer measures 8" diameter. Made of brass. See Pike's Catalog pg. 280, fig. 313. All the above are in fine condition and contained in a green painted wooden box (in various compartments) measuring 12-14/" x 10-1/4" x 93/4" English, first quarter 19th Century. Made of mahogany, boxwood, brass, metal foil and glass. When the prime conductor is connected to an electrical charge, the pith balls placed in the cylinder will dance up and down carrying the electricity from the upper to the lower plate. 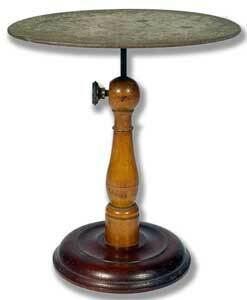 Mahogany base measures 3" in diameter and the apparatus is 8-7/8" at highest point. See Pike's Catalog Vol. I pg. 277, fig. 303 Fine condition. English, Circa 1840. Used in early electrical experiments and electro-therapy to insulate the subject from a path to electrical ground. 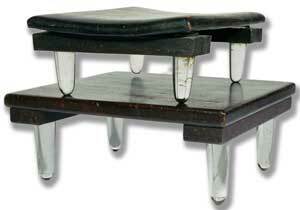 Made of wood and varnished glass legs. They measure 13-3/4" x 12-1/4" (height: 5-3/4") and 12-3/4" x 9-1/2" (height: 4-1/2") respectively. See pg. 260, fig. 275 in Pike's Catalog Vol. I and pg. 522, fig E216 in Public and Private Science: The King George III Collection Fine condition. English First Quarter of the 19th Century. In 1867 Lord Kelvin - William Thomson (1824-1907) demonstrated that static electricity could be produced from dripping water. In the late 1770's there was a heated debate regarding the relative merits of a point or ball as the upper termination of the lightning rod. Benjamin Franklin (the inventor of the lightning rod) supported the idea that the rod should terminate in a point; his experiments had shown that a pointed conductor connected to ground would "bleed off" an electrostatic field without the occurrence of a spark. 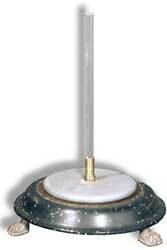 Others (primarily in England where Franklin wasn't well liked due to his support of the American independence) believed a ball would make a better spark gap, after all, most of the devices up to this time used a brass ball as an electrode - Franklin's "point" being a relatively new idea. It is reported that Dr. James Lind of Edinburgh invented the Thunder House in order to verify Franklin's theory. 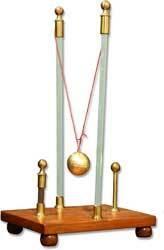 Experiments with the device would indicate the Franklin was wrong and the ball is better, but In truth the apparatus proves nothing. On the enormous scale of nature there is little difference between the two. 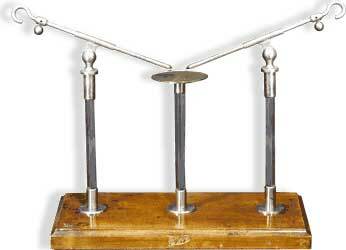 Invented by Alessandro Volta in 1775, the electrophorus is a simple device for generating static electricity. The glass rod is held in one hand while the metal disk is rubbed with animal fur. An electrostatic charge builds up on the disk which can then be transferred to a Leyden jar, etc. At the beginning of the 19th century, there were some who believed the moon’s orbit of the earth was due to static electricity. This planetarium was designed by an Italian inventor to “prove” the theory. 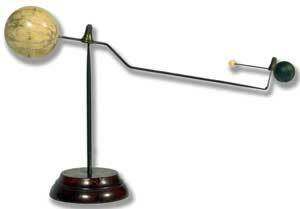 When the device is attached to a friction machine, the gold ball circles the planetarium. Operates on the same principle as "Franklin's Bells." 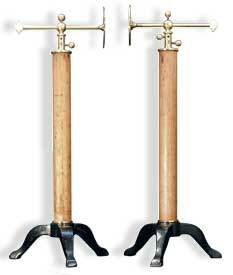 This is an early device used to experiment with the properties of a condenser (now known as a capacitor.) 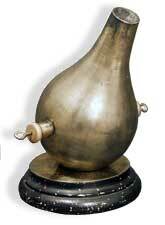 The Aepinus condenser was the first condenser developed after the Leyden jar and was used to demonstrate conductive and inductive electricity. The device is constructed so that the space between the plates can be adjusted and the glass dielectric (insulating plate between them) can be removed or replaced with other materials. 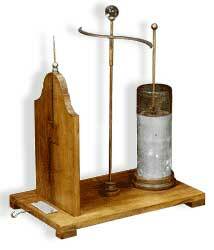 Dischargers were used with early friction electrostatic machines to transfer electricity from the machine to another device such as a Leyden jar. Phrases, and pictures were constructed on the surface of the glass plate using lead foil. When voltage was applied from a static machine, the words and pictures seemed to be displayed in sparks. 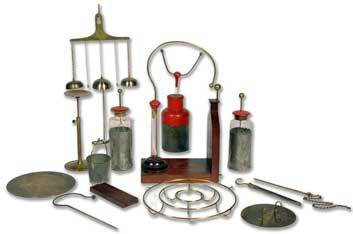 These devices were used in early experiments with electric fields produced by high voltage friction electrostatic machines. They were used to demonstrate distribution of charges across the surface of an object as well as induction - where the charge on one object creates a charge on another object. 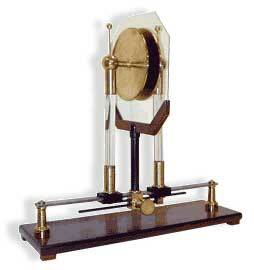 This apparatus was used to demonstrate distribution of electric fields on a surface. 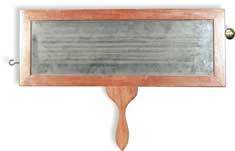 It consists of a metal screen with paper strips attached to the surface of the screen (the strips are missing on this unit.) The screen may be manipulated using two insulated handles. As the screen is brought together into a closed loop, the paper strips on the outside surface stand out, while the inside strips do nothing - demonstrating that charge is carried on the outside of a closed surface. Invented by Benjamin Franklin, lightning rods were very popular in the 18th and 19th centuries throughout the US and Europe. See Thunder House, above, for more information on lightning rods.